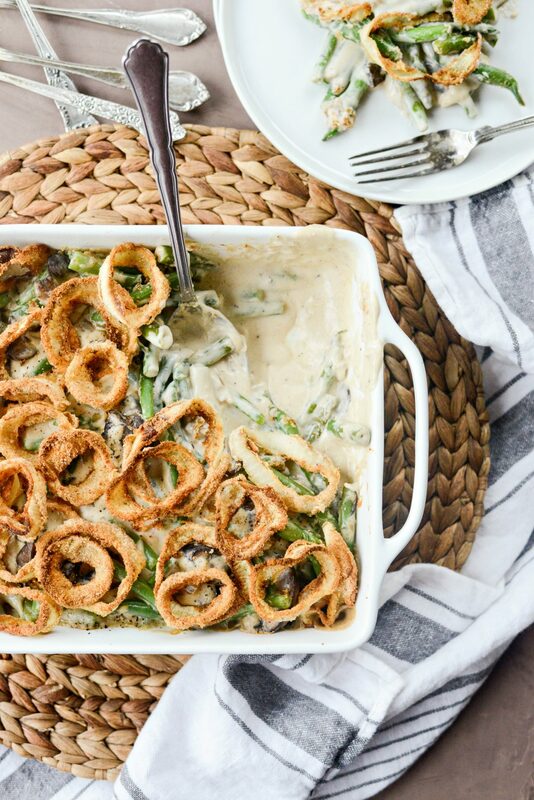 Make this from scratch Fresh Green Bean Casserole with Onion Ring Topping this holiday season! 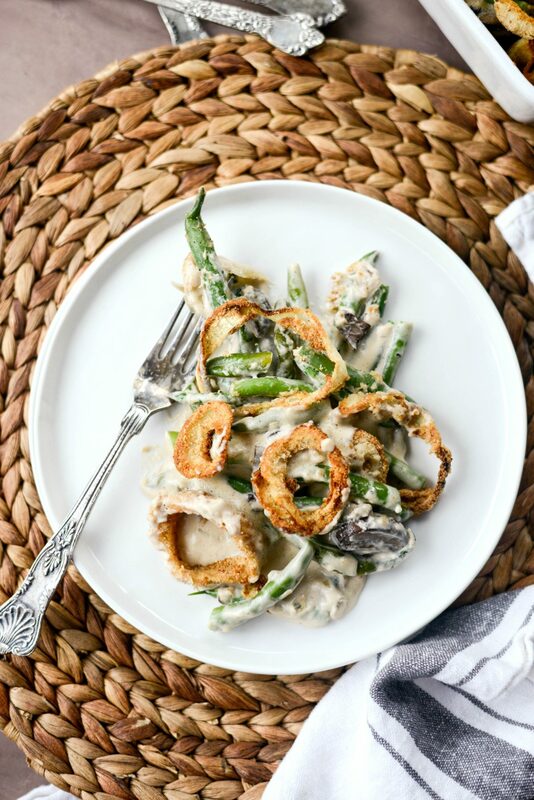 Green beans tossed with a creamy homemade mushroom sauce is topped with crispy air-fried onion rings and baked until bubbling and delicious. Serves 6 to 8. 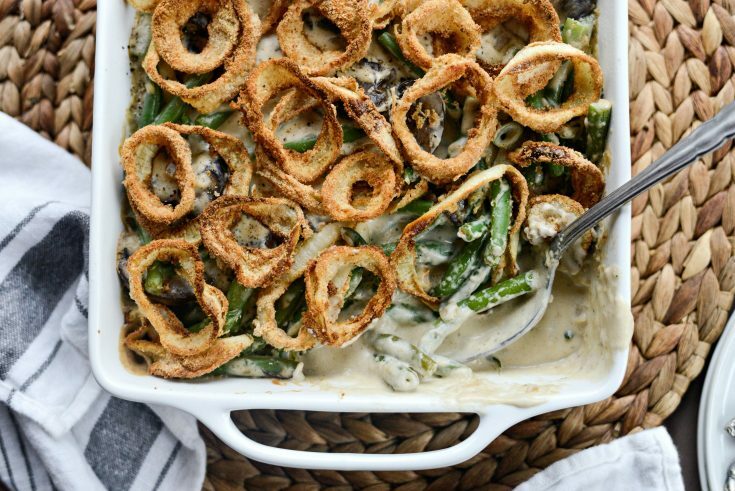 As if you couldn’t guess, my favorite Thanksgiving side dish is and always will be, green bean casserole. 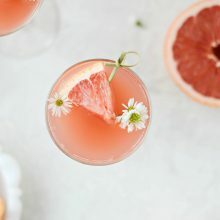 A few years ago I made a homemade version, and while it’s super delicious. I still wanted that crispy fried onion topping. 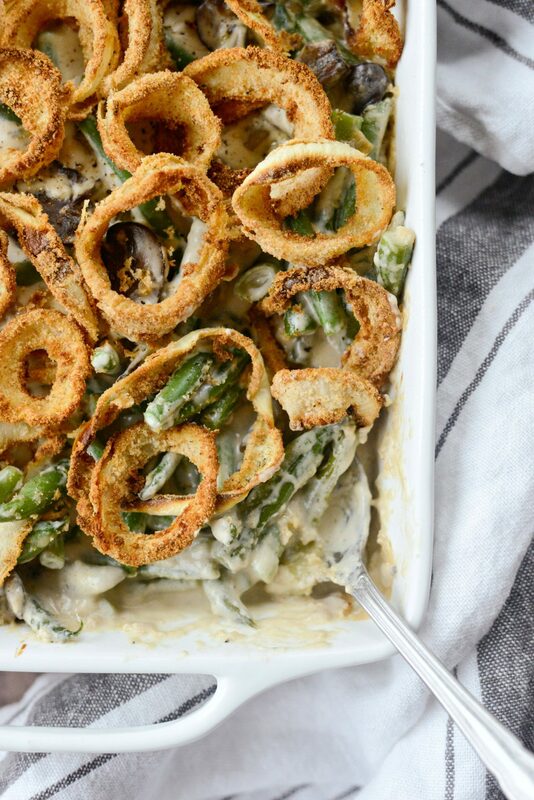 It’s the reason why people love this casserole so much, amiright? SO after owning my air-fryer for a year now, it has easily become my favorite appliance. And it makes the perfect topping for my homemade green bean casserole. 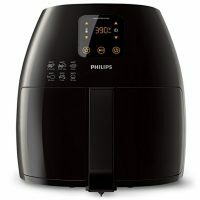 Meet the reason why I wanted an air-fryer. It’s true! You guys, I’ve been patiently waiting to share this recipe with you and with a week until Thanksgiving, it’s time. Because what’s thanksgiving without green bean casserole? 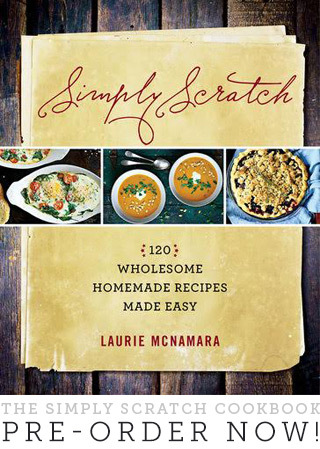 Especially one that’s completely from scratch? 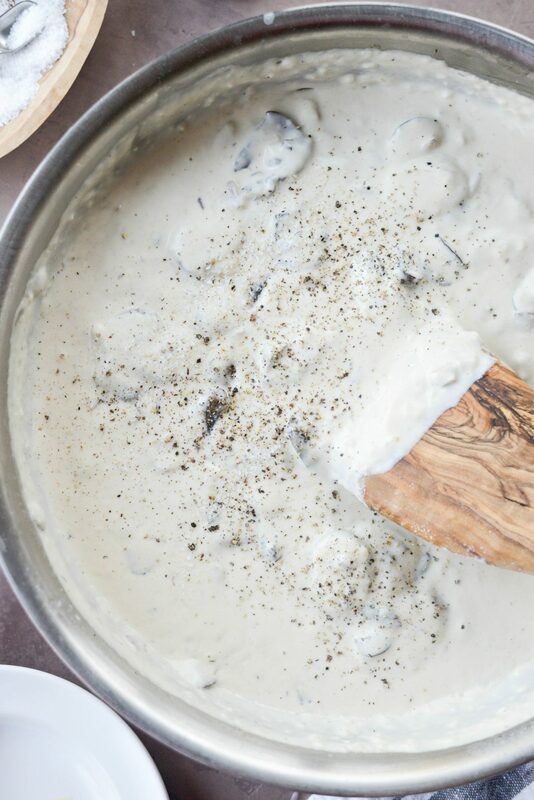 No can of cream of mushroom soup needed. 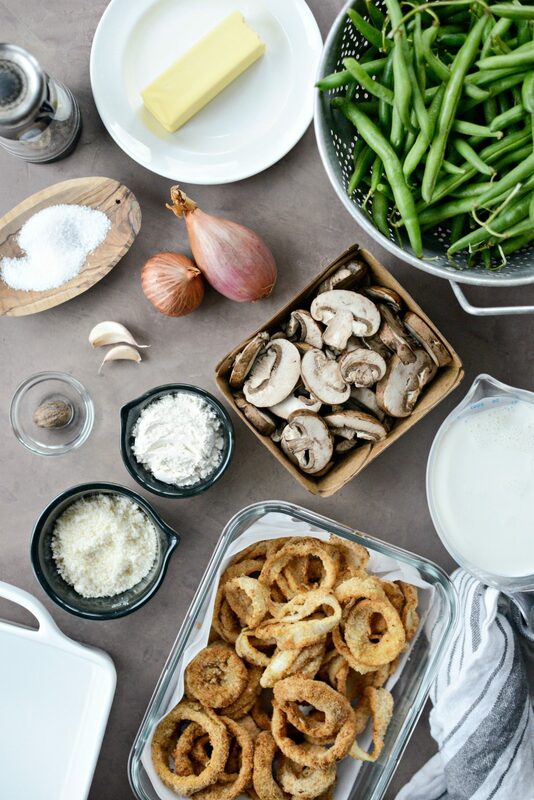 Just simple, fresh ingredients for the best green bean casserole deserving enough to grace your Thanksgiving table. 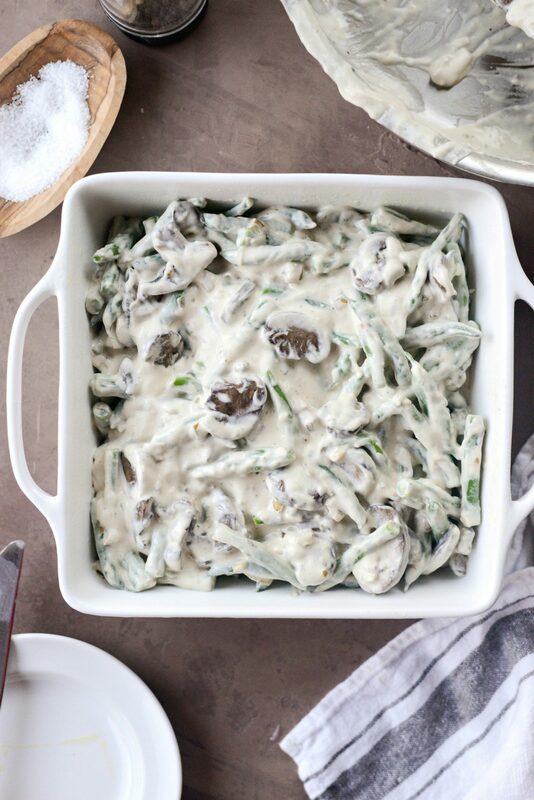 Here’s what you will need to make this classic homemade green bean casserole; 1-1/2 pounds fresh green beans, 6 tablespoons unsalted butter, 1 shallot, 8 ounces sliced fresh mushrooms, 1 to 2 cloves fresh garlic, 1/4 cup all-purpose flour, 2 cups half and half, 1/8 teaspoon freshly grated nutmeg, kosher salt and freshly ground black pepper, 1/3 cup freshly grated Parmesan cheese, and beer battered onion rings. 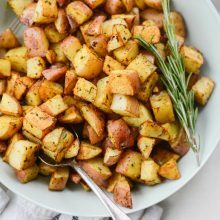 If you don’t have an air-fryer you can still make this recipe. 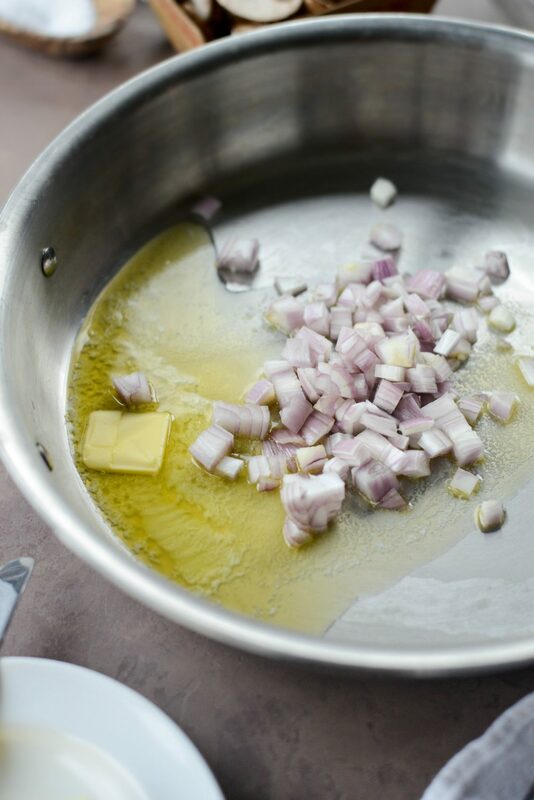 Either slice up a bunch of shallots and fry them in 1 tablespoon each butter and olive oil until crispy or buy the store-bought crispy fried onion topping. No judgement here. 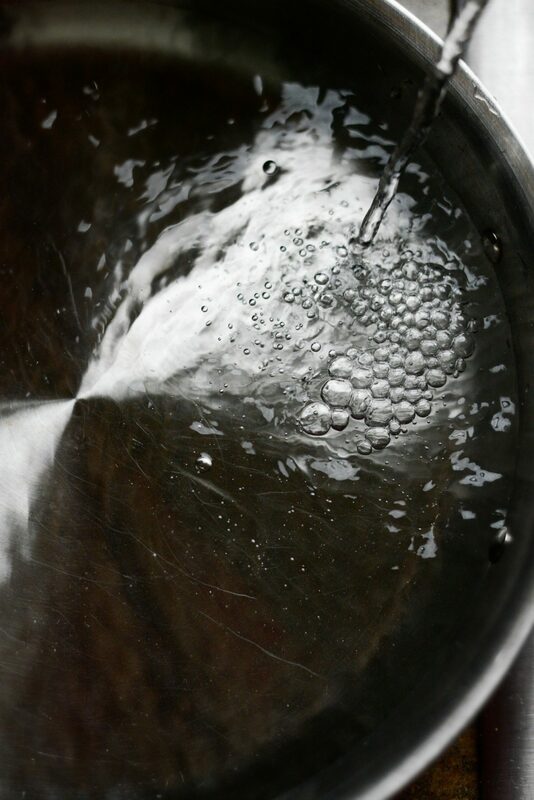 First bring a large pot of salted water to boil. 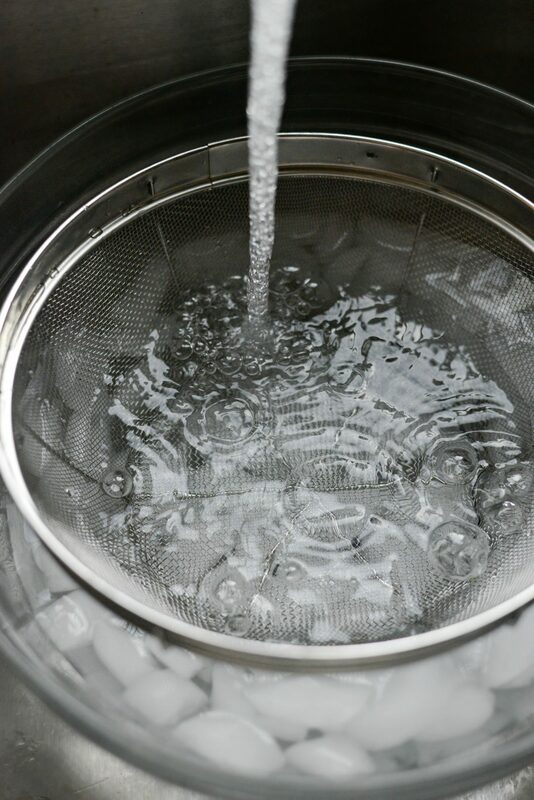 Also, fill a large bowl with ice and set a mesh strainer or colander in the center and fill with water. Next, trim and cut the green beans in half. Once the water is boiling, add all of the green beans and simmer for 6 minutes or until bright green and just starting to become tender. 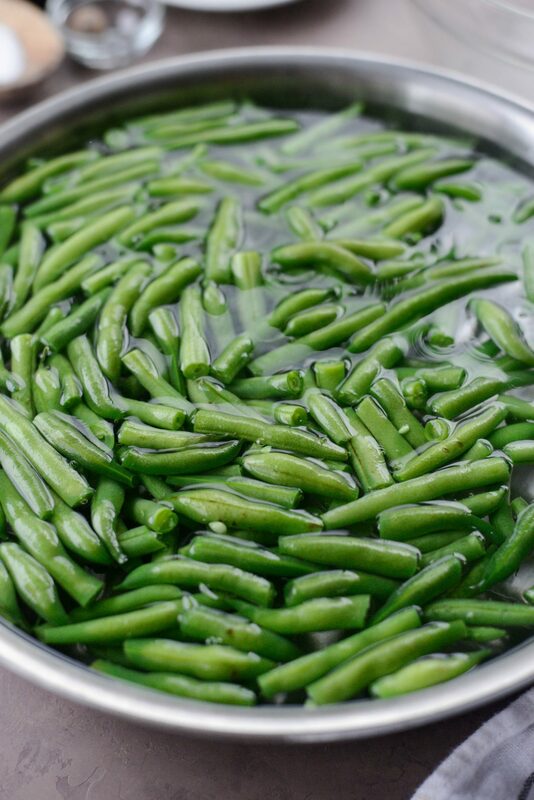 Transfer the green beans to the waiting colander in the ice bath. 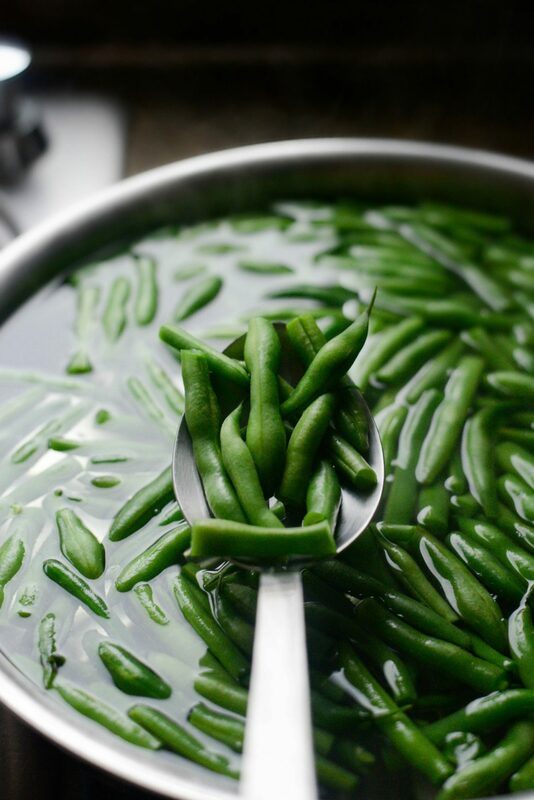 Once they have stopped cooking and are cool to touch, remove the strainer holding the green beans and drain well. Set these off to the side for a moment. 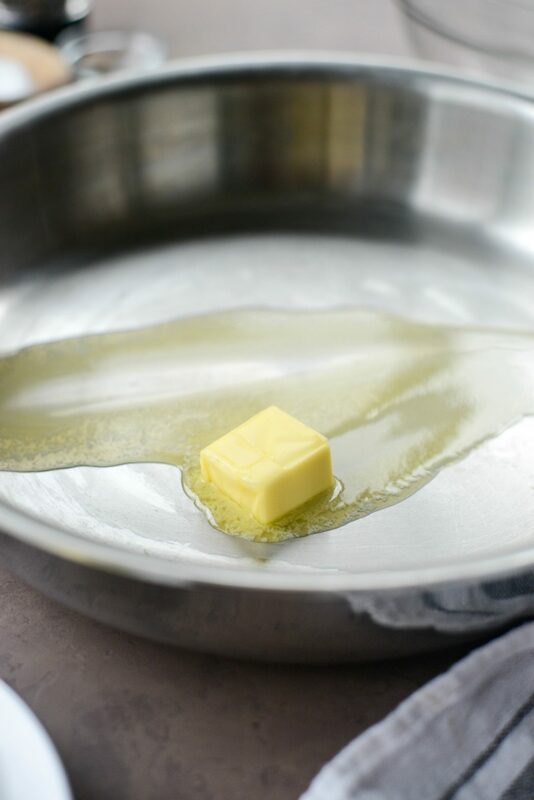 Next melt, 2 tablespoons of butter in a large skillet over medium-low heat. 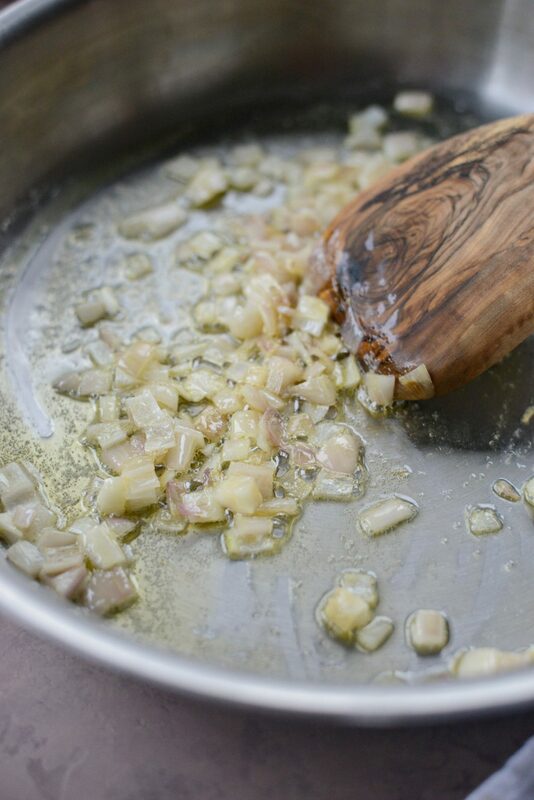 Add the shallots with a pinch of kosher salt and sauté until tender, about 5 minutes. 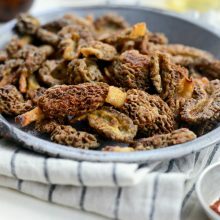 Next add in all of the sliced mushrooms. I’m using cremini, but button would work too. Stir and cook until just tender, about 5 to 8 minutes. Then add the garlic and cook for 1 to 2 minutes. Then add in the remaining 4 tablespoons of butter and stir in 1/4 cup unbleached all-purpose flour until absorbed. Cook the flour for 2 to 3 minutes, stirring occasionally. Next, pour in the 2 cups of half & half and stir, over medium-high heat, until thickened. Stir in 1/3 cup freshly grated parmesan cheese. 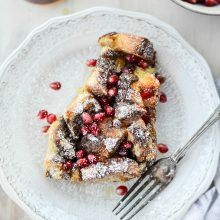 Then season with 1 teaspoon kosher salt (more or less to taste), 1/2 teaspoon freshly ground black pepper and 1/8 teaspoon grated fresh nutmeg. 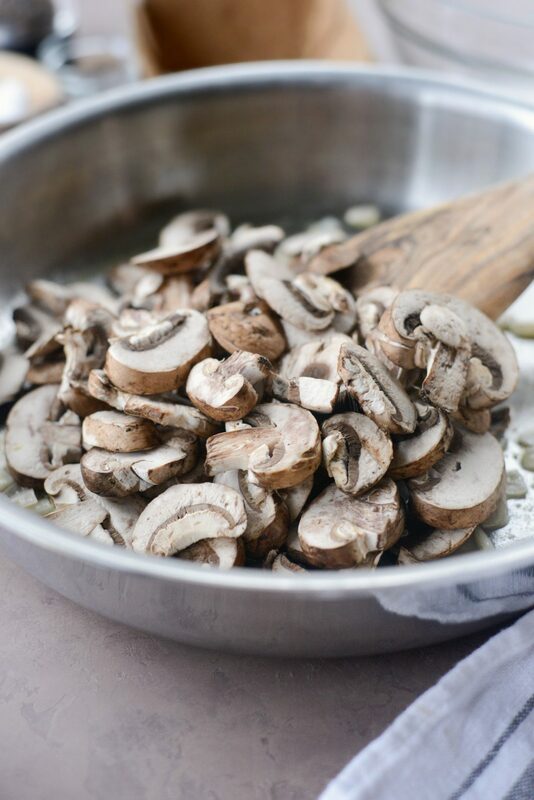 Lastly, toss the blanched green beans in the creamy mushroom sauce before pouring the green bean mixture into 9×9 (or 8×8 would suffice) baking dish that has been sprayed with olive oil spray. Cover tightly with aluminum foil and bake on the middle rack of your preheated 350° for 20 minutes. Next, remove the foil and scatter the lightly battered onion rings over top. Continue baking for an additional 20-25 minutes or until the casserole is bubbling and the onion rings are crispy and a deep golden color. Enjoy! 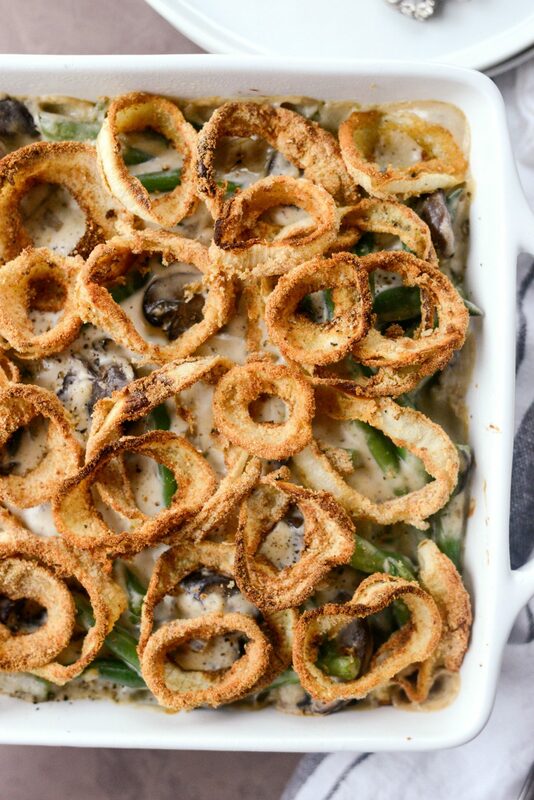 And if you give this Fresh Green Bean Casserole recipe a try, let me know! Snap a photo and tag me on twitter or instagram! 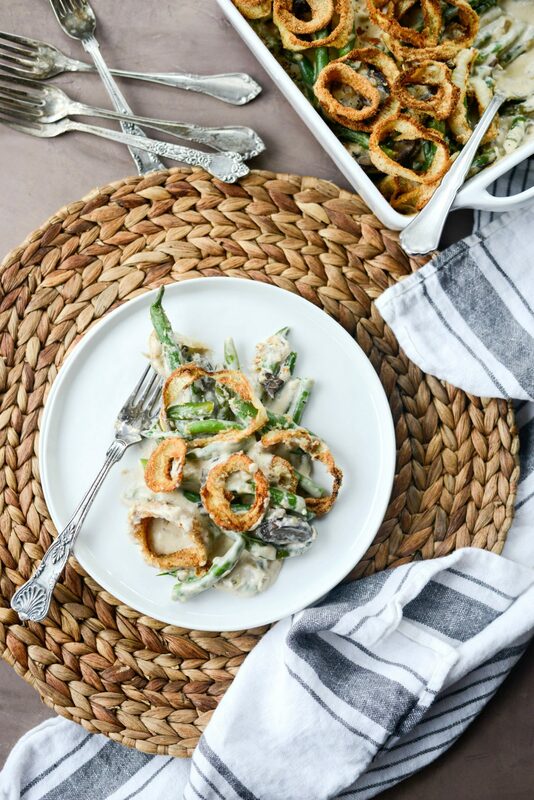 Make this Fresh Green Bean Casserole with Onion Ring Topping from scratch this holiday season! 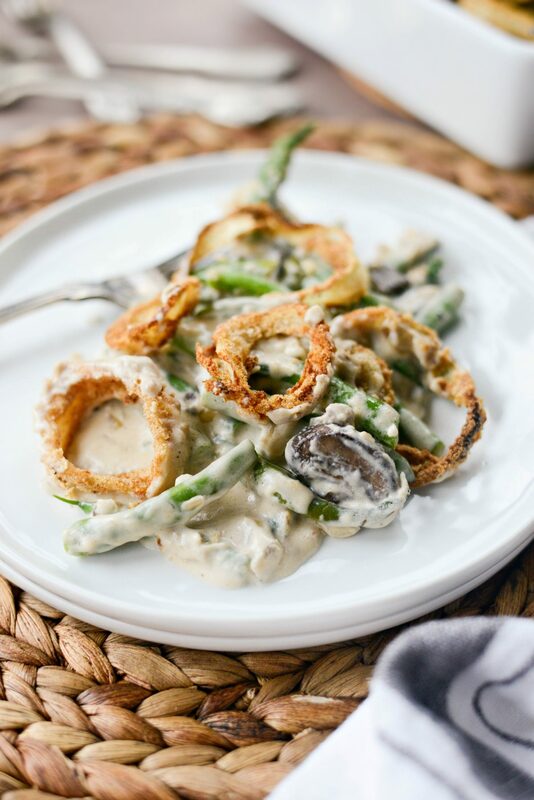 Green beans tossed with a homemade mushroom sauce and topped with crispy air-fried onion rings! 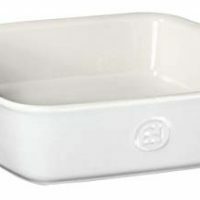 Preheat your oven to 350° and spray a 9 x 9 baking dish with olive oil spray. Fill a large bowl with ice water and place a colander inside. 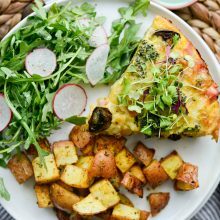 Fill a 12-inch, deep-sided skillet with water half way. Bring to a boil and stir in 1 tablespoon of sea salt. Add in the green beans and simmer for 4 to 6 minute or until slightly tender. 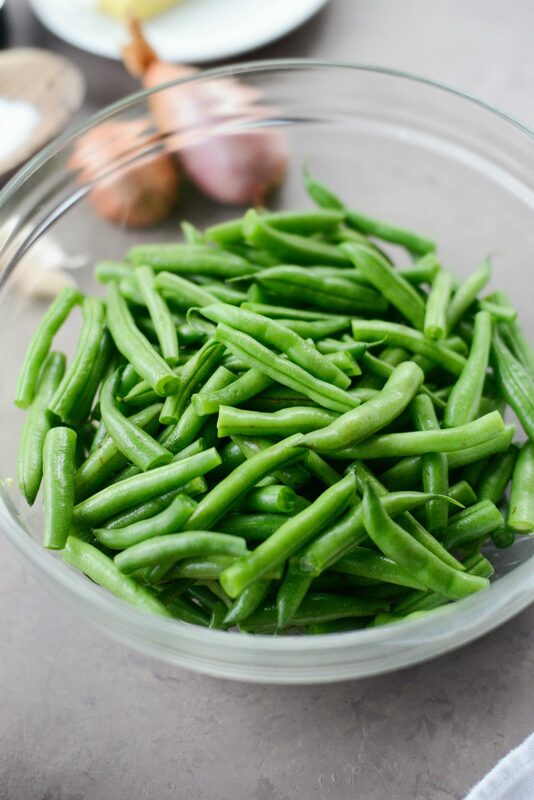 Use a slotted spoon to transfer the blanched green beans to the colander in the ice bath, discarding the remaining water in the pan. Once the green beans are cold, remove the colander and drain the beans. 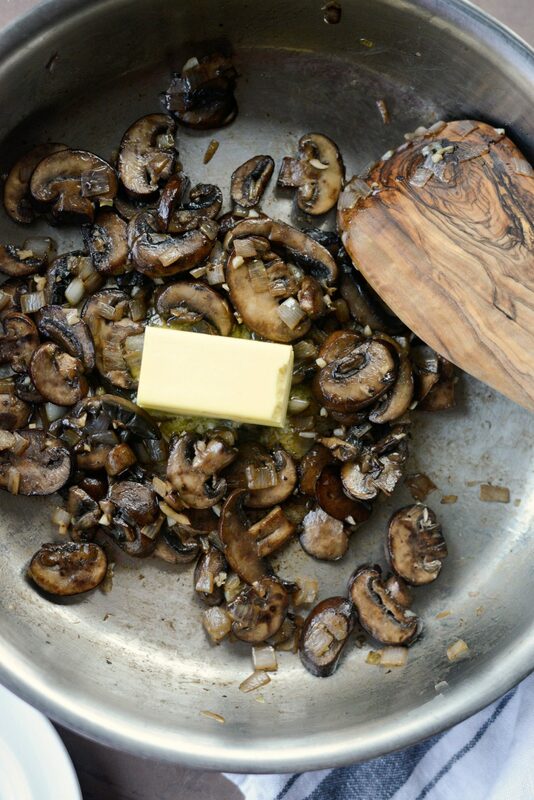 In the same skillet, melt 2 tablespoons of butter over medium-low heat. Add the shallots and a pinch of kosher salt. Stir, cooking until soft. About 5 minutes. 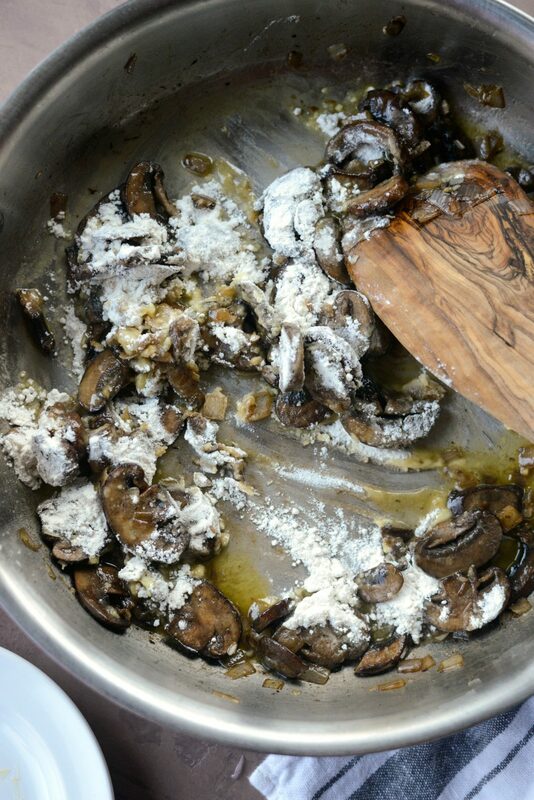 Next add in the mushrooms, stir and cook until tender. About 5 to 8 minutes. Add in the minced garlic, stir and cook for 1 to 2 minutes. Then add in 4 tablespoons of butter. Once the butter has melted, sprinkle the flour over top, stir and cook for 2 to 3 minutes. 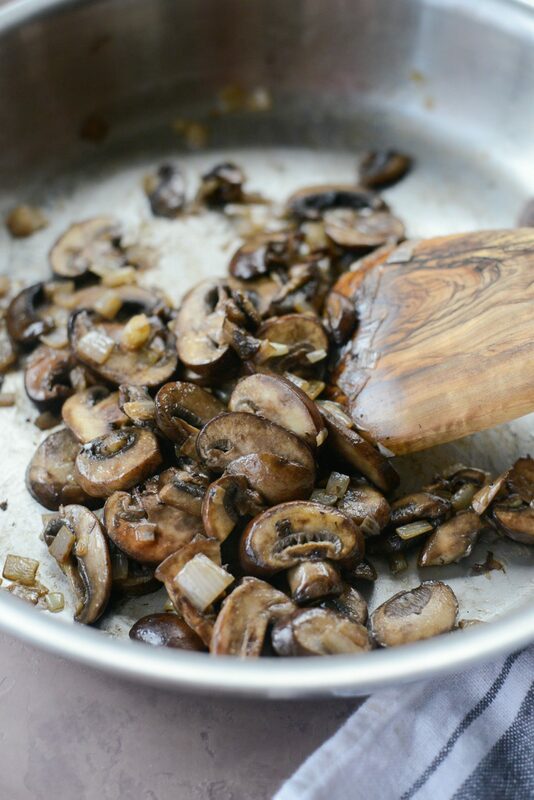 Stir while pouring in the half and half, scraping any browned bits off of the bottom of the skillet. 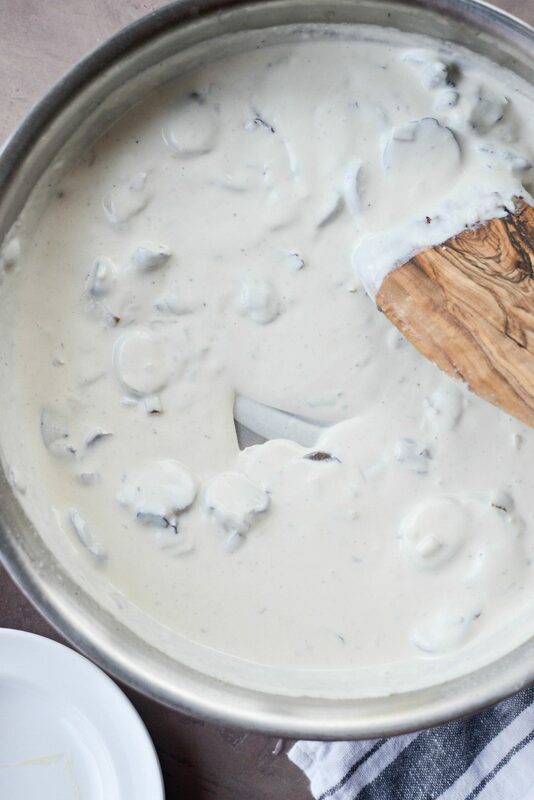 Increase the heat to medium-high, stirring constantly until thickened to a creamy soup consistency. 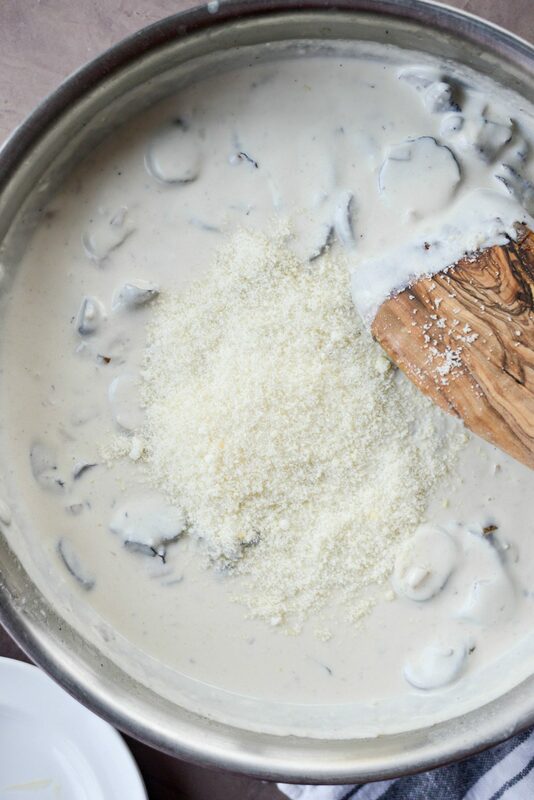 Remove off of the heat and stir in the parmesan cheese. Season with the nutmeg, kosher salt and freshly ground black pepper. 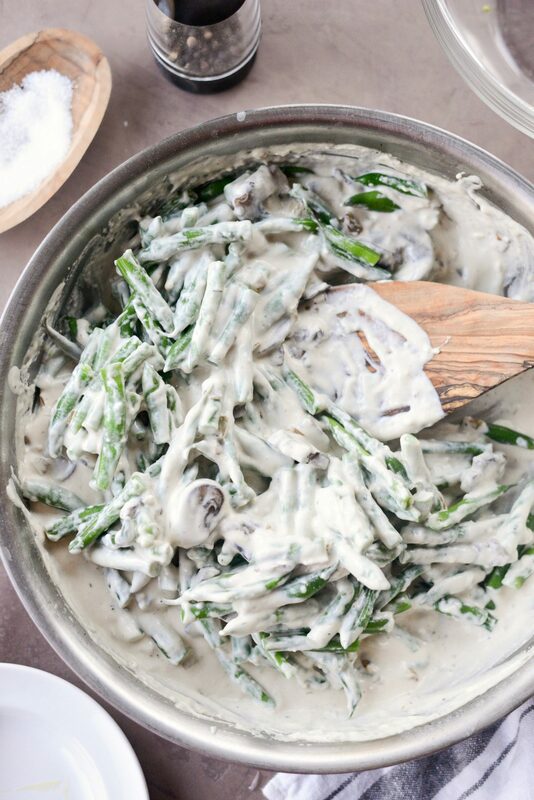 Add the green beans to the mushroom sauce and toss to coat. Transfer green bean mixture to the prepared baking dish, cover with aluminum foil and bake on the middle rack of your preheated oven for 20 minutes. Remove the foil and scatter the fried onions over top. Place back into your oven for 20 more minutes or until the onion are crisp and the casserole is bubbling. If making in advance. 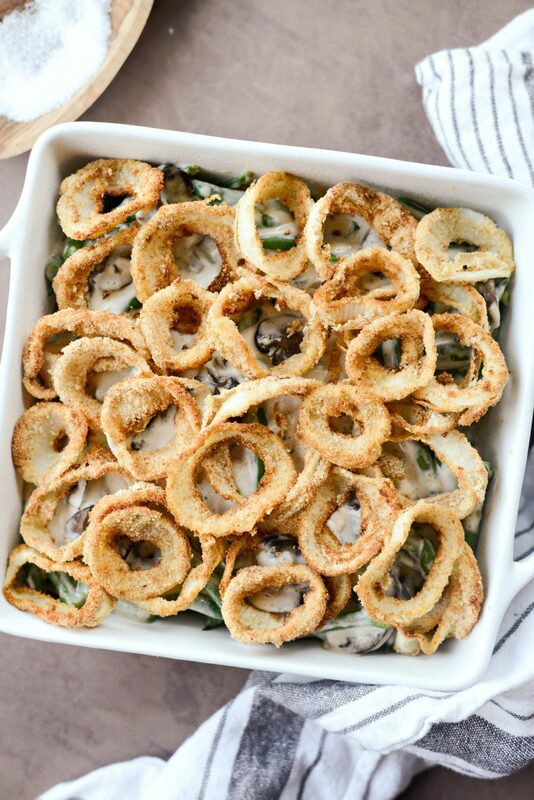 Prep the onion rings and the casserole and store separately. Remove 30 minutes prior to baking, and follow the remainder of the instructions. 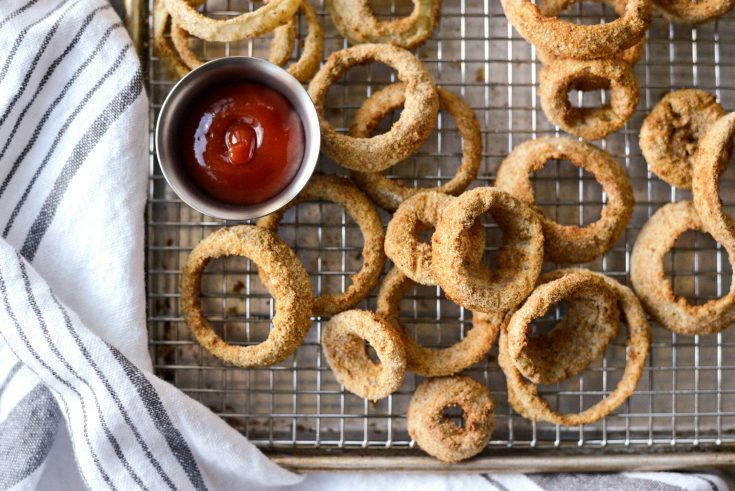 Baking until bubbly and the onion rings are golden brown. 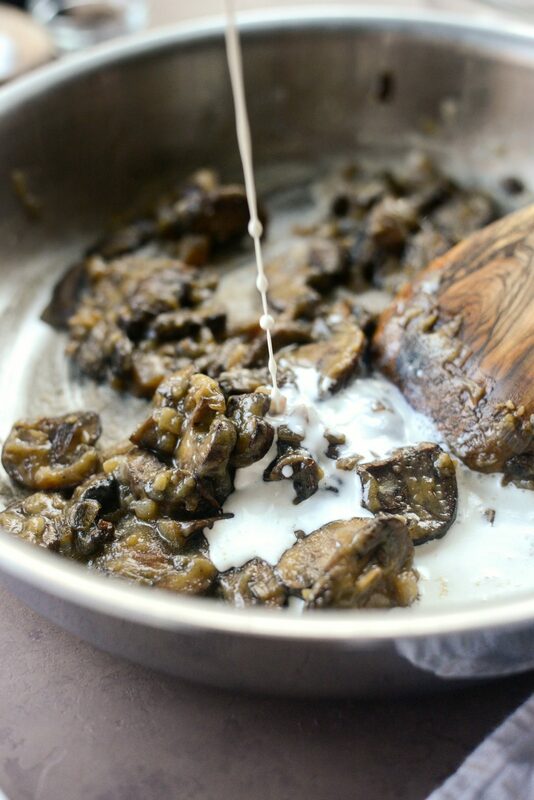 Trying this tonight… but thought I took a moment to point out a couple of issues with the directions, right after the mushrooms are added and cooked. 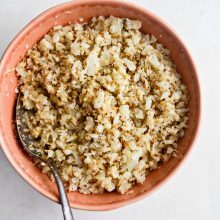 – in the step by step directions, there is no mention of adding the garlic. And as usual I am taking longer than you to put it all together. Otherwise I am super excited to try it because IT SMELLS DELICIOUS!!! I just put it in the oven to bake. Wish me luck! Either would work. 8×8 holds 2 quarts and a 9×9 holds 2-1/2 quarts.